Hey! I can’t wait to share this super simple breakfast recipe with you! 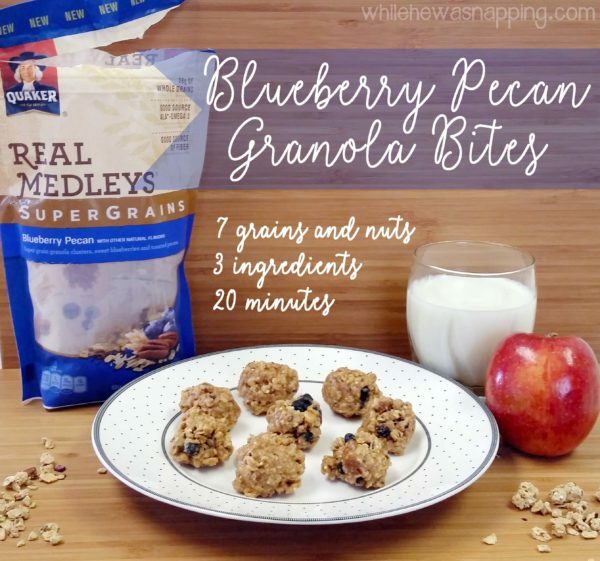 These granola bites will rock your taste buds and are a great addition to your breakfast menu or as an afternoon pick-me-up. But, first, let me tell you why these are so awesome. There are 8 different nuts and grains in each bite, which means energy for you! They are a good source of fiber (yippee) that tastes great (YIPPEEE)! Are your mornings CRAZY?! Rushed? Ours are. The shuffle of getting kids to school, my husband to work, getting the little boys fed and playing, getting my morning chores and workload underway can make for a really hectic way to start the day. It’s not uncommon that I’m getting my little guys lunch before I realize I never ate breakfast. 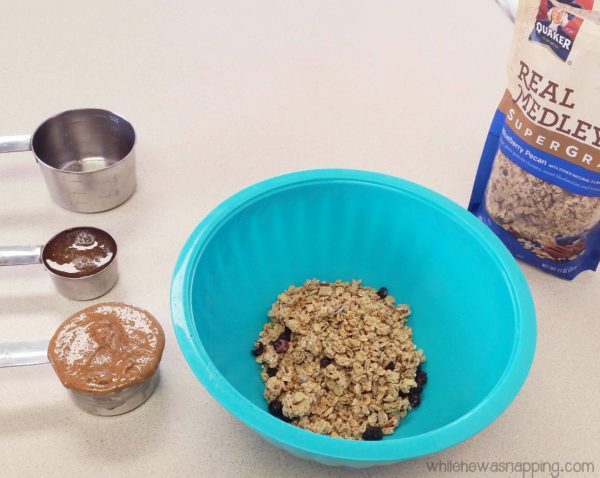 Get the energy you want and the nutrition you need with these delicious granola bites! 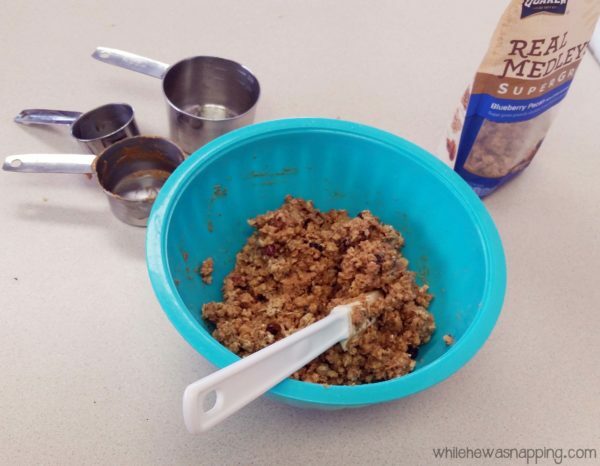 Enter Blueberry Pecan Granola Bites. 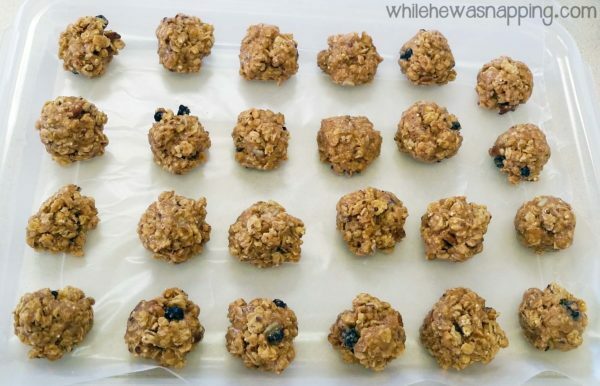 The main ingredient in these bites is granola. 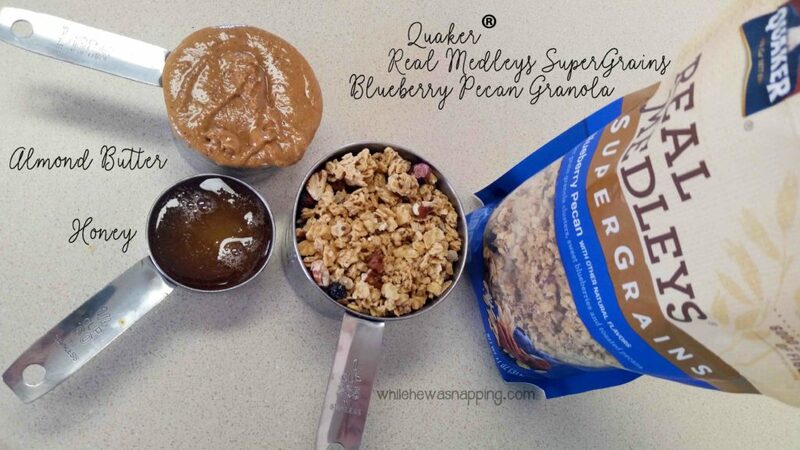 I used Quaker Real Medleys SuperGrains Blueberry Pecan Granola, which has SEVEN kinds of nuts and grains – oats, wheat, sunflower seeds, flax, amaranth, barley, quinoa – toasted pecans and sweet blueberries for delicious flavor with the nutrition boost you’ll crave. It’s a great source of fiber, ALA omega-3 and whole grains. 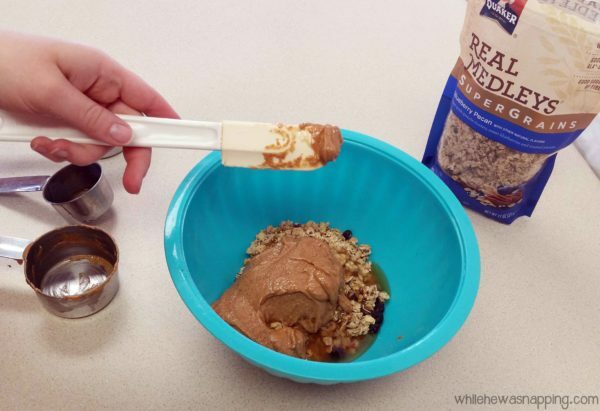 Add a bit of almond butter and a touch of honey and you’ll have delicious grab-and-go granola bites in twenty minutes. Promise. It’s that easy. You’ll love them and so will your family. Granola is great for breakfast, snacking and baking without being over indulgent. 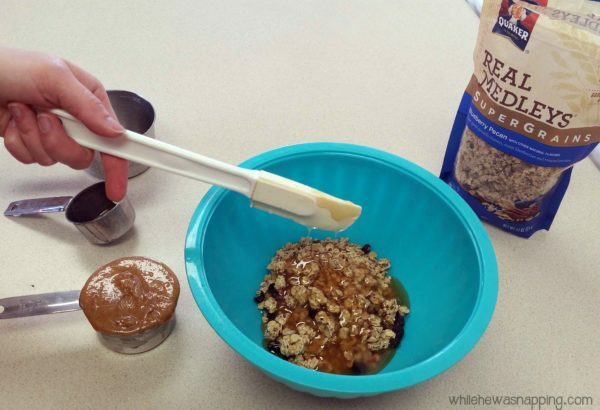 There’s just the right amount of sweet mixed in with those grains and nuts. 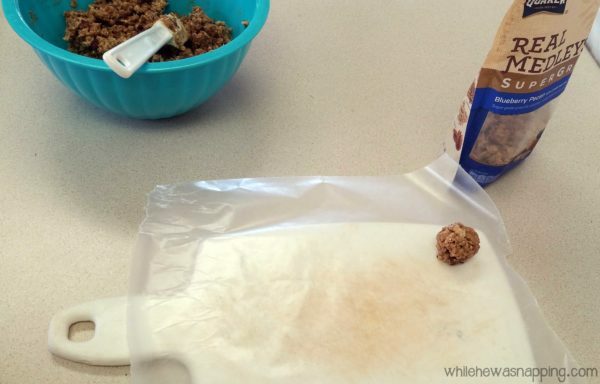 You will love how easy and enjoyable these Blueberry Pecan Granola Bites make it to get your grains, fiber, and Omega-3’s into your diet, no matter how crazy and busy your life may be. Okay, now let’s get these put together!